In this irreverent guide, a bestselling comedy writer and noted psychotherapist teach parents how to handle their grown kids. Gail Parent is an award-winning writer and producer whose credits include Tracey Takes On, starring Tracey Ullman, The Carol Burnett Show, Mary Hartman, Mary Hartman and The Golden Girls. Also a bestselling novelist, Parent is the author of Sheila Levine Is Dead and Living in New York. She lives in Beverly Hills, California. Susan Ende has been a psychotherapist in private practice for twenty-five years and has taught at the California Institute of Technology, Pepperdine University, and California State University, Los Angeles. 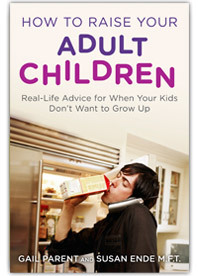 How to Raise Your Adult Children would be a great book for every parent in the world except me. I don't need it. My Melissa is a perfect child. And if she continues to be really nice to me, I'm going to tell her which of my jewelry is real. I love this book. It begins where Dr. Spock left off. If only Mama had had it. Eunice wouldn't be so aggravated. This is a brilliant idea! You, Gail, are the Mother of all Mothers. Why your boys, who are adults with children of their own, left home in the first place, I'll never know. Please adopt me so I can have the funniest mum in the world.